You have a print now you just need a frame. But what frame size do you need? The answer to this question is easy to figure out. All you need is a a ruler or tape measure. 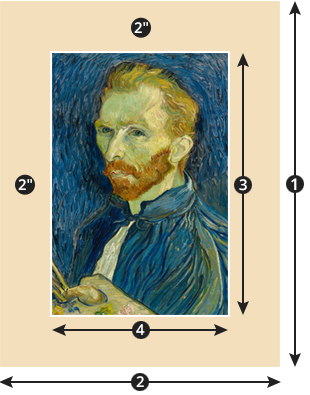 You need to measure the exact height and width of the outside dimensions of your artwork to the nearest inch. These dimensions represent the size of picture frame and/or facing that you will need. For example, when you view our frame listings and see an 18″ × 24″ frame for sale, that frame is built to fit an 18″ × 24″ print. when framing an image only, measure the height and width. Suppose you want to add a 2″ mat to your 18″ × 24″ print, how do you know what size of frame to order? A 2″ mat border would add a total of 4″ to both your overall height and width. So your 18″ × 24″ print with mat would measure 22″ × 28″ and thus, you would need to order a 22″ × 28″ frame and mat. when framing an image with matting, you will need to measure the overall height and width. *Remember to add 4″ to both height & width to determine correct mat & frame size. Understanding your frame profile and how a rabbet works is important in determining a correct frame size. 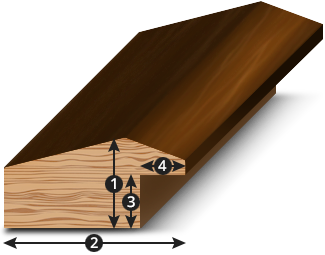 Moulding profiles have four basic measurements; moulding height, moulding width, rabbet depth and rabbet width. The rabbet is an area of overhang, or "lip", that your print sits in when mounted in your picture frame. 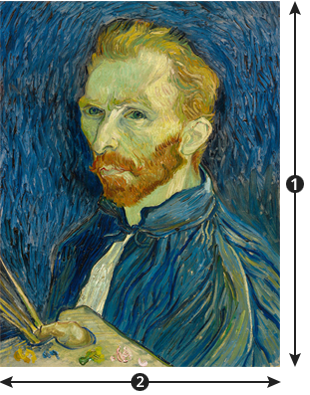 A Rabbet width of ¼″ is standard on most frames and constitutes the differance between the the frame's viewable area and 'to fit' size. The rabbet height comes into play when you have a print that is of significant thickness. In this instance, you'll need to look for a picture frame that has a deep enough rabbet for your framing needs. To receive the correct size picture frame, it's important to understand how frames are measured, the difference between the viewable opening and the 'to fit' size. Measuring the opening—or viewable area—from the front (display side) is incorrect. It is also incorrect to measure to the outside of the frame moulding. Measuring the frame opening from the back (including the rabbet) is correct. This is known as the 'to fit' size. This means the viewable size of a frame will be the 'to fit' size less the rabbet width. For example, an 18″ × 24″ frame is to fit an 18″ × 24″ print with a viewable opening of 17½″ × 23½″. Larger frames come with a hanging hardware kit and requires some assembly. Before you start to panic let us assure you that the process is easier than you might think. Follow these instructions and you'll have your picture frame hanging on the wall in no time. STEP 2: Determine whether your frame will be hung horizontally or vertically. On the back of frame measure down approximately 1/3 the distance from the top of the frame on both the left and right sides. This is where your D-rings will be installed during Step 3. STEP 3: The D-rings should be installed using the screws provided. An electric/battery powered screw driver or drill is recommended. The D-rings should be installed so the flat portion is on the frame and the ring is hanging over the backing of the frame. This step is repeated for both the left and right sides of the frame. DO NOT attempt to install D-rings on the cardboard backing of the frame. STEP 4: With the D-rings installed on both the left and right sides of the frame. Loop the Wire through one D-ring as shown. STEP 5: Twist the wire around itself several times, as shown. To ensure secure hanging, loop a portion of the wire back through itself. Use caution when handling the wire so as not to poke yourself on the wire ends. STEP 6: Run the wire through the second D-ring allowing a bit of slack, and cut the wire approximately 6 inches past the frame. Then, repeat Step 5 for this side of the frame.